Warning: Don’t try and stick this clam in your chowder. Scientists have built a robotic clam that isn't edible but could be incredibly useful, because it easily outperforms other commercial digging devices. This RoboClam, described at the American Physical Society meeting in Denver, could prove invaluable as a low-energy anchor or as an environmentally safe way to lay down more intercontinental, undersea fiber-optic cables. The Atlantic razor clam (Ensis directus) is a small, weak creature, about 4 to 8 inches in length. It has a weak squishy body that pokes, tongue-like, out of a long, narrow shell with a painfully sharp rim that looks like a closed straight razor (hence the nickname). And yet these clams can be hard to catch because of their remarkable burrowing ability – they can easily escape a hungry human digger. 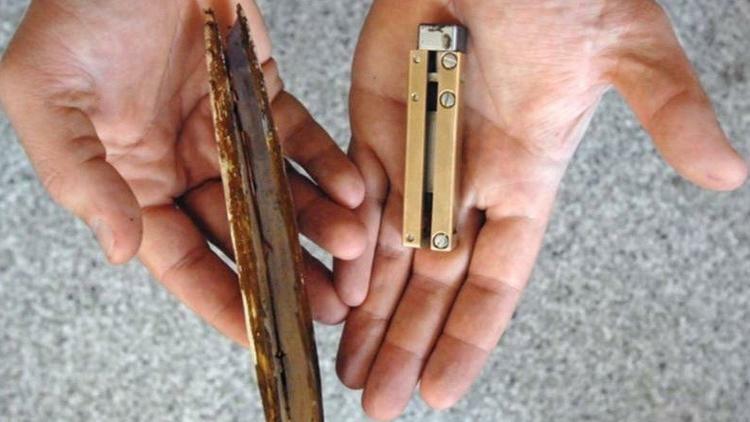 The razor clam outstrips humans' mechanical diggers, too. When researchers compared the digging efficiency of the clam to commercial digging devices like anchors, it found that it was 10 times as efficient at digging as the machines on the market. This means it uses far less energy to get through such densely packed sand. But what gave the razor clam, not to put too fine a point on it, such an edge? A team of researchers from MIT and the University of Maryland decided to find out. “The idea was just to trust that nature has designed a good way to do this,” said lead author Kerstin Nordstrom, a soft-matter physicist at the University of Maryland. The scientists studied the razor clam and found that it digs quickly by "fluidizing" the sand it’s digging into, making it act like a fluid rather than a solid. It does this by contracting its body and sort of sucking in, creating a vacuum that causes the sand to become unstable and start moving around. This fluid-like mix of grains and water is much easier to displace and dig through than a floor of solid, unmoving sand. With this principle in mind, the researchers built a prototype that would fluidize the sand in the same way. Nordstrom and her colleagues used a mathematical model to check whether the RoboClam was properly fluidizing sand. They found that timing was key: start digging too quickly, and the sand wouldn’t have enough time to "get up to speed"; start digging too late, and the sand would have already started settling. The RoboClam worked as they predicted. Researchers are now building a larger version at MIT. Such efficient digging devices could be useful for ocean surveys or geological surveys or surveillance. That's because the relatively small robots charged with such work easily get pulled along with the current, but don’t have a whole lot of extra energy to spare to anchor themselves to the ground. Bluefin Robotics, which supported the research, makes just the kind of robots that would benefit from such a low-energy anchor. And as the Internet continues to grow, a clam-like digging device could be an environmentally friendly way to lay down more submarine data cables between continents, without bringing in large digging devices.